Did you know that fluoride is the most effective agent to prevent tooth decay? Fluoride is a mineral that is naturally present in many foods and water supplies. The benefits of fluoride have been known for over 50 years and are supported by many professional health organizations. That’s why Carolina Dental Arts offers fluoride treatments in Goldsboro and all of our locations throughout North Carolina. In addition to fluoride treatments at our NC dent offices, topical and systemic fluoride are part of our daily lives, and can be helpful depending on the patient’s age. Topical fluoride strengthens the teeth once they have matured by seeping into the outer surface of the tooth enamel, making the teeth more resistant to decay. Products that contain fluoride, such as toothpaste, mouth rinses and gels, help us gain topical fluoride. Carolina Dental Arts recommends that children have a professional application of fluoride twice a year during dental checkups. 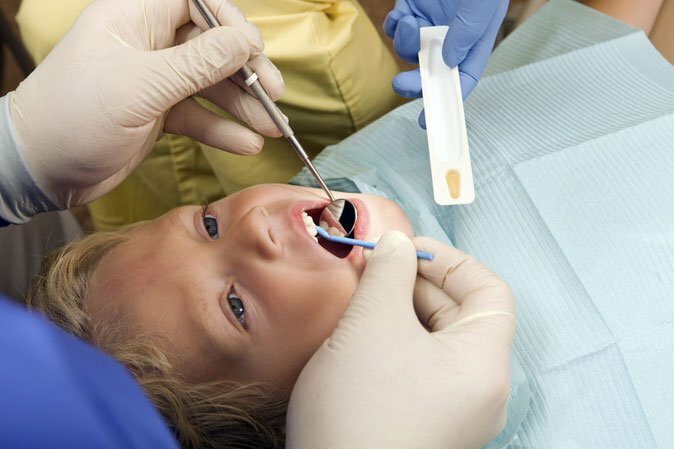 Systemic fluoride strengthens teeth that have fully grown, as well as those that are still developing under the gums. We can gain fluoride from foods and water, and it is also available as a prescribed supplement in drop or gel form. Fluoride drops are often recommended for children, as well as tablets that can assist them through their teen years. Please note that it is important to monitor how much fluoride a child ingests. If too much fluoride is consumed while the teeth are developing, a condition called fluorosis (white spots on the teeth) may occur. At Carolina Dental Arts, our NC dental fluoride treatments are part of our general dentistry services and are usually administered during teeth cleanings. If you are interested in our fluoride treatments or any of our other procedures, contact ustoday and schedule an appointment with our experienced dentists.